The first weekend of 2017 Dallas Cowboys Cheerleaders Auditions has wrapped, Rounds 1 & 2 are in the books. While reviewing my judges’ notes, three major themes emerged. The DCC considers itself a family, a true ‘sisterhood.’ Family and legacy were on full display during Round 1 at AT&T Stadium in Arlington. Stealing the show in Prelims was a mother-daughter pair from New Jersey. Suzanne, a 55 year old IT analyst and grandmother of 2, auditioned side-by-side with her 24 year old daughter, Cary Lynn, a special education teacher. 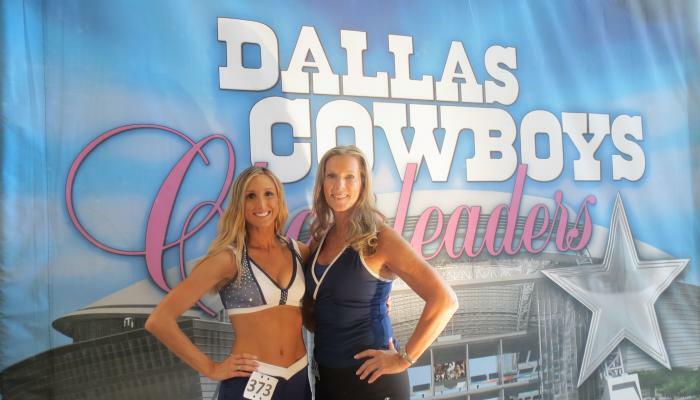 For both, DCC Auditions were ‘bucket list’ items. A year ago, when Cary Lynn decided that she would audition in 2017, she bought Suzanne an airline ticket as a combination Mother’s Day present and birthday present. Cary Lynn not only invited her mom to accompany her to Arlington, she encouraged Suzanne to audition alongside her. At first Suzanne planned to only come along for moral support and participate in a DCC Prep Class on Friday night, the evening before Round 1. But as the trip drew closer, she allowed Cary Lynn to add her name to the registration list. She and Cary Lynn had extensive dance backgrounds, so they decided to ‘go-for-it’ together. Round 1 is ‘Freestyle Dance’ meaning there is no choreography or set routine. Contestants come onto the dance floor in groups of 5. They don’t know which song will play; they can do any dance moves they want. Suzanne rocked the house with splits which she brilliantly executed. Impressive for anyone, but especially for a 55 year old! Suzanne and Cary Lynn inspired many contestants and judges in Round 1. In talking with both of them following Prelims, I asked Suzanne what she would tell anyone who, like she and her daughter, have DCC Auditions written on their ‘bucket list’. That’s a message worth spreading. Cary Lynn was able to pursue that aspiration on Sunday as she advanced to Round 2. This mother-daughter dynamic duo from New Jersey was not the only family connection. There were two sets of sisters that auditioned. One set of sisters attended Sacramento State together. There were also 2 ‘legacy’ DCC (they are the daughters of former Dallas Cowboys Cheerleaders). Because it’s so competitive and the level of dance skill is so high, it’s very difficult to make the DCC on your first go-round of auditions. Very few DCC members make it on the squad in their first try. That means we have a lot of contestants that audition multiple times, year after year. In Round 1, of 200+ contestants, 68 had auditioned previously. Of those 68, 12 had made it all the way to Round 3/Finals. And of those 12, 5 were invited to 2016 DCC Training Camp but were cut before the football season started. Each of those 68 – and especially the 12 in Finals and 5 in Training Camp – had come ‘oh-so-close’ to realizing their dream of making the team. But they didn’t let last year’s disappointment keep them from trying again. As a judge, I particularly appreciate the resilience of the hopefuls who have auditioned multiple times. I can think of at least a dozen who have auditioned three-or-more times. Each year, they return with resolve and judges can see the progress they’ve made. Their determination is truly inspiring. Like our 55 year old mom/grandmother Suzanne said, they’re all succeeding because they’re pursuing their aspirations. I’m constantly amazed by the reach of the DCC. Contestants travel from far distances to pursue this dream. They are different ages, with different career paths, and diverse backgrounds. In Rounds 1 & 2 this year, we had contestants from 34 of the 50 United States, plus two from Washington DC. We also had one contestant from Japan, and one who grew up in Belgium. We had a 27 year old mother of two kids who was dual background of Argentina/Brazil. There were several others who grew up in multiple countries because a parent served in the military. This coming weekend (May 13th) in Round 3, we have two returning veterans who grew up overseas (or Down Under, in one case): Jinelle (Australia), and Yuko (Japan). Because the DCC are widely considered the most elite squad in professional sports, there are many cheerleaders from other pro teams – including the NFL – that decide to leave their home team and come to Arlington to cheer for America’s Team. I jotted some notes as contestants introduced themselves to judges. Here’s a list of some of the teams for which contestants have cheered in the past. NFL: Patriots, Texans, Dolphins, Jets, St Louis Rams, Titans, Ravens, Buccaneers. NBA: Mavericks, Cavaliers, Bulls, Pistons, Spurs, Thunder. As for the career and educational backgrounds of this year’s contestants, it was an impressive group (so many have advanced degrees, such as a masters degree in analytics!). We had a physician and several lawyers. We had several Spanish speakers, including one who is also fluent in sign language and works for a company that is translating the Bible into sign language. We had a contestant that is legally deaf, another who at 18 years old is a cancer survivor. I’ll share that list in my next blog posting later this week!!! Thanks for checking out what’s happening so far through auditions!! !